Sunday May 21, I spent the day in prison. 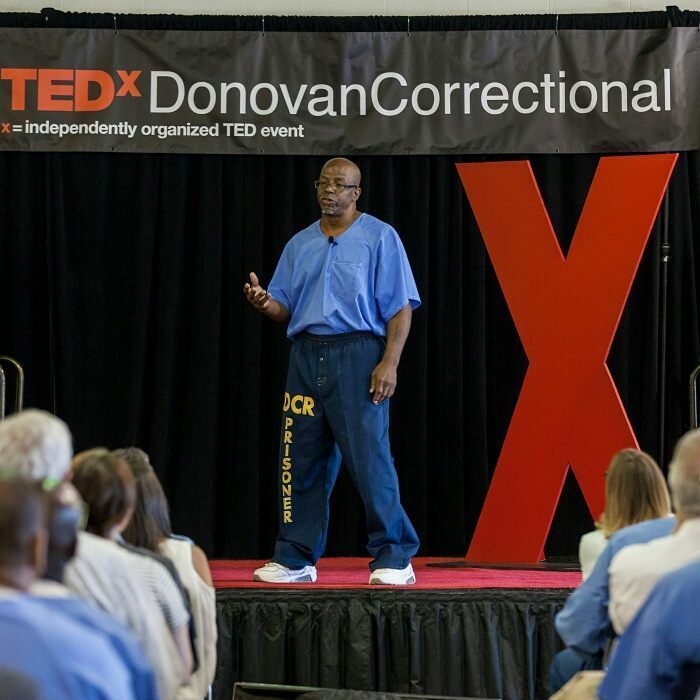 I was fortunate enough to attend a Tedx event hosted at Donovan Correctional near San Diego, CA. And what I saw, heard and experienced resonated with me deeply. My own core values were reflected back to me over and over again through the stories and conversations. Only 25 Tedx events have occurred in prisons out of the 20,000 Tedx events around the world, shared our narrator for the day. It was no easy feat to make this happen – requiring volunteers from the community, volunteers from inside Donovan and mostly, the passion, commitment and vision of the men in blue. We all have the freedom to write our own stories. The speakers at this event were world class – engaging, intelligent, connected, funny and honest. The stories of grief, loss, recovery and redemption brought me to tears over and over again. There were 5 men in blue like Lionel featured above and 5 outside speakers chosen by the men. Each story mirrored my belief that we all have the freedom to write our own stories, and to rewrite them again and again. The theme of the day was Beyond the Surface and each presenter powerfully riffed on this theme through music, poetry, and story. Beto, one man who had been incarcerated and spoke on rebuilding his life, shared how his description of “normal” had to shift and change. How his normal as a child was not what he wanted “normal” to be for his children now. He is a man who is rewriting his story from one of gangs and violence to one of education, service and connection. Pursue growth and learning every day. We were treated to the beautiful music of Eric Genius. Here is a Youtube video of Eric performing his song “The Butterfly.” Many of the men in blue had never heard classical music before. What?? Most men I met had been incarcerated for decades. One gentleman had been in prison for 40 years. I loved hearing him share about his children and his grandchildren with pride and joy. What these men have is time. They were all conscious of how they choose to spend their time – in learning, educating themselves, in mindful or spiritual reflection. John has completed 4 associates degrees during his time in prison. Another man I spoke to is a year away from his Bachelor’s agree. And while the speakers were amazing – leaving us laughing, cheering, crying and celebrating – the best part of the day was the opportunity to connect with the 100 men in blue who were the organizers, volunteers, attendees and speakers who made this day possible. We spent several hours simply talking, sharing and connecting. It was humbling to hear their stories, their wisdom, their willingness and desire to continuously improve themselves and mentor others on their journey. I have been to many different kinds of events in many different parts of the world but I felt welcomed into this community with kindness, with generosity and with gratitude. At the end of the day, the 200 of us in the room formed a large circle and anyone who wished to could take the center of the circle and share their impressions of the experience. Man after man in blue humbly entered the circle to thank us for seeing them as human; for allowing them to feel human for a day. We are all human and connection matters more than anything. And when we can truly see each other as humans who are all the same, anything is possible. Lionel’s story, in the photo above, touched me deeply. He shared stories of loss and grief, of his Dad selling his pony – the only love he had as boy was from that pony. He shared lessons of love learned from a rabbit he found as a small boy growing up on a ranch. And he shared how he found self-love as a man in prison and rediscovered that he has a heart and that he is loveable. I wish I had photos to share of the beautiful artwork that was shared. Two large murals were painted to add some color to the otherwise beige room. And the walls we covered in the most beautiful assortment of mandalas I have ever seen. If you know me, you know I love mandalas!! Making them, coloring them and admiring the work of others. One man Brian, shared that he had never painted before and hadn’t drawn since he was a kid. He shared much he loved the process of creating the murals and how great it felt to be able to share his creativity with all of us. What a powerful experience to see my core values reflected back to me through the worldview of the men in blue. Our core values are the guardrails on our highway of life – they guide us and help us to make better decisions. But they also help us to connect with others in ways we cannot imagine. I am curious, what are your core values and where might you see them reflected back to you in a way you didn’t expect? Thank you for sharing this extraordinary event Minette. To share a story, my mother writes monthly to a man in prison (from the 3 Strikes Law) in California. She visits him a couple times a year and he has become like a son. He now teaches spiritual principles to his fellow inmates, and says prison is the best thing that ever happened to him. Each of the stories you listened to are profound and I imagine the event created a shift in everyone who attended. As I comment – I am listening to the incredible music of Eric Genius. I love this post! Love the story about your mom, Debra, that is so cool!! And I love that in many ways, letter writing is kept alive be these guys as their way to connect with the outside world. And yes, what a treat to connect with Eric Genius! Hi Minette, What a powerful and insightful article! I love the 3 themes or lessons you “pulled” from your recent experience and the emotion you shared from being with and connecting with the men. Eric Genius’ performance of “The Butterfly” was so beautiful and expressive! My core values of Love of Learning, Making a Difference, Connection, Freedom and Adventure have guided me throughout much of my life. They assist me in making decisions about career, relationships … and have definitely served and continue to serve me as “guardrails on the highway of life”. Thanks for sharing your wisdom and experience. Thanks Pamela. Love that you are conscious of your values and can name them so easily. Part of our journey is being conscious of our values and how they motivate and guide us. I am a huge believer in the idea that we have the power to write our own stories and to re-write and edit them as we grow in love and understanding. What a powerful experience that must have been. Thank you so much for sharing it with us. Thanks, Barb!! And I think what I learned was the powerful part about re-writing and editing! There were many times my human services career intersected with some portion of the judicial/correctional system so I find the idea of a TedX in prison positive and inspiring. I have often compared coaching and therapy to editing ones’ life story so I appreciate your comments about that. What also comes to mind is the choices each of us makes about how we spend our time and, of course, the importance of connecting with the humanity in everyone. Thank you for sharing your experience. Thanks Andrea – I love the perspective on coaching or therapy as way to edit our stories! What a terrific experience. I printed out a copy for a niece in prison and an extra for her to share with someone in Admin. Tresa has been on several panels where outside folks come in to gain a different perspective (community groups, teachers, and others). She’s told me that although she is always nervous talking in front of people like that she feels so rewarded afterwards when people come up to say thanks and to wish her well. Thank you for sharing this story, Virginia! Wow…beautifully written. Even more, you sharing your experience with these very special men. It’s humbling…& also a wonderful reminder that regardless of our circumstances…we can, in fact, create a special and influential life. Thanks for sharing Minette. What an inspirational post about an inspirational day. It made me really reflect on what the word ‘normal’ means to me and how it is so different for many other people. Thank you Minette. Thanks Tracy – that was the impact it had on me too. Hard to think about gangs, violence and drugs being someone’s normal or being the victim of abuse as normal, but it’s true. A great reality check.